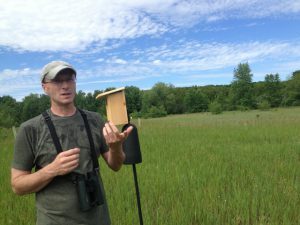 One day, a fellow birder at DeYoung pointed out that the swallows had rejected an ancient nesting box on the property and had moved on to find a nesting box cavity elsewhere. Dan, concerned that the DeYoung property would lose the swallows on a long-term basis, saw an opportunity. He hoped he could provide new birdhouses for them and other birds, too. Swallows AND Bluebirds–Could it Happen? Barbara loved the idea. Dan reached out to the Conservancy and the two boxes went up. 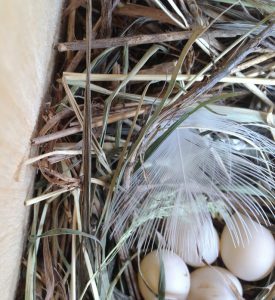 Within a few weeks, a nest appeared in one, filled with four translucent white swallow eggs. The other box remains empty, but Dan is hoping that a bluebird will move in soon. Barbara bought the store last September, with a higher purpose in mind than just turning a profit. “There are so many cool people up here with great energy doing good things,” she says. “Selling merchandise has its place, but we wanted it to be about more than just, ‘Can we ring that up for you.’” Since then, the store has held “feeder-exchange” events, providing discounts to customers if they will donate their old or broken feeders. Dan and other staff clean and repair them, then donate them to schools, nursing homes and other places, along with seed. Barbara, whose first husband died of cancer, has made arrangements to donate new feeders and seed to Munson Medical Center’s new cancer center. Dan promises to lead a migration hike out at DeYoung next May. Maybe by then, the bluebirds will be there. Ed. note: Thanks also to LIanne Somerville, who is on our Auction Committee. She had been into the store to solicit for an auction item but is also a longtime customer at WBU. Dan told her what he wanted to do at DeYoung and she passed the info on to our stewardship staff. Thank you, Dan and Barbara. That’s so wonderful.